â€¨I wonder how many are like me, starting off with high hopes and mature expectations and then, a week before Christmas, or Easter, are lamenting the lack of spiritual discipline, the fast-paced lifestyle, the hectic stuff that comes up day by day, eroding a sense of very deeply entering the liturgical cycles. What happened to my Lenten devotions, my contemplative intentions, the self-reflection and study and silence and fasting? As is usually the case, in Advent and Lent, it comes undone pretty quickly for our household. Where did the weeks go? Here are six resources on spiritual formation that might jump-start your Lenten journey, get you back on track, revive your soul in these next weeks. Taking just a few intentional hours to prepare for Holy week might be beneficial, you know, and a new book or DVD like this might offer the assist you need. Or perhaps you know someone you could gift with a book—just a token of friendship, sharing the Lenten love. 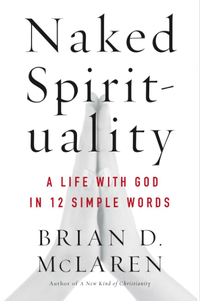 Naked Spirituality: A Life with God in 12 Simple Words Brian McLaren (HarperOne) $25.99 I have to admit I went into this with my guard up. I love Brian and yet realize that many think he has gone a bit too far in reconstructing “a new kind of Christianity.” I disagreed somewhat with Scot McKnight, for instance, in his serious critique in Christianity Today a year ago of the previous McLaren book of that title although I do share McKnight’s concerns. (Read Brian’s reply, here, too.) Still I am wary. I hope that isn’t an indication of a lack of generosity in my reading but just my evangelical scruples reminding us to not take lightly serious deviation from “mere Christianity” (as most of the church has understood it for most of church history.) Some may roll their eyes at my theological concerns, while others have rolled me out the door for daring to suggest that we read widely and host tough questions. speaking to those who have not been attracted to church, or to those who have drifted, or been “de-churched” by toxic congregations, or have big questions that they feel (rightly or wrongly) are not permitted in the religious groups they know. (He had a whole book, now divided into two smaller ones, which was essentially a letter and ongoing dialogue with an unchurched seeker he came to know, inviting her step by step, without propaganda or pushiness, to consider what she believed about deep things, about Christ and about the gospel.) McLaren speaks plainly, honestly, with gentle solidarity with those who are “spiritual but not religious.” He makes sense in ways that some of the more obtuse spiritual writers—from contemporary liberal mystics to old Puritan divines—simply don’t. I don’t mean just to say he is easy to read and comprehend (although that isn’t a bad thing in a book, of course.) He speaks about life as most of us experience it, down to Earth and honest, candid about struggles and perplexities and disappointments. He notes in the video promo clip above that this book is really close to his heart. It shows. â€¨â€¨I have never had much sympathy for that “spiritual but not religious” phrase (and here is a spectacular critique by Chris Smith of the Englwood Review of Naked Spirituality poking at McLaren’s willingness to even consider the plausibility of spirituality without religion. They suggest McLaren’s postmodern sensibilities have been betrayed as this idea that one can have religious experience inside one’s own head outside of and not connected to a gathered narrative tradition is pretty darn Modernist.) â€¨â€¨Still, there are those who see themselves as driven away from (or, at least, not attracted to) congregations of worship and they hunger still for guidance on how to pray. They could go to some silly avatar from the latest new age trend or take up classic Eastern practices, and some do. McLaren is generous about all that, seeing the good in many traditions and practices, but he is also a passionate Christian evangelist. He wants to talk about the God of the Bible as revealed in Jesus the Christ, if in less dogmatic tones than some are used to. This is a tremendous resource for these kinds of seekers, drawing on a bit of interfaith insight, rooted seriously in the gospels, clearly Christian and full of common sense clues to learning the art of a life with God. And it’s loaded with pastoral advice, simple instruction, helpful analogies, and tons of stories of Brian’s own life. I’m happy to announce that most of my fears were unfounded and this book does what it sets out to do. And more. bsp; Of course he tells of saving turtles. He writes about some hurts he has received, some hurts he has caused. These stories are honest and kind and good, presented well, coming across as a long conversation with a wise older brother. At every point they illustrate the life of a real and raw experience of God and the human responses we offer. What I initially found a bit odd, almost off-putting, and frankly which created some suspicions—I’m just not that drawn to overly mystical ambiguities and want things explained, if not nailed down—was the minimalist approach, and the very structure of the book: each unit is a lesson on prayerfulness by way of using just one word. (Well, he gives you some alternate words in each section, too.) He has two chapters on each of these single words. And you know what? This ended up being very helpful, nearly brilliant. Again, my suspicions were mostly melted, as Brian’s kind style, clear teaching, and wise counsel were more than evident as the subtitle is explored, word by word, practice by practice. The book is arranged well, develops very well, section by section, and I found myself wanting to share stories, insights, ideas with Beth as I read and pondered. This is the sign of a good book for me, and I hope many BookNotes fans read it. In the aftermath of last year’s New Kind of Christianity and the recent hubbub around Rob Bell’s Love Wins, many traditional evangelicals will be wary. Fair enough. But I think those who mistrust this (as I nearly did) should be open to its treasures. Give it a try and see for yourself. It is going to be really helpful for many, and I count myself very glad to have read it. I suspect I will come back to it often. I really appreciated and enjoyed how Naked Spirituality is arranged. It does a sort of “faith development” thing, moving towards “seasons” of life and the different takes on our unfolding faith during each “season.” These ring very true for me, and I am sure they do for many of us. McLaren is clear that these aren’t fool-proof stages or lockstep phases that are set in stone. And he is clear we cycle through these stages various times in our spiritual journey, so there is no need to get caught up in questioning this developmental framework, as if it is one unbroken upward evolution, which is not how he describes it. (I can just hear it now, some lame critic who knows Brian studies Darwin and appreciates the complex beauties of evolutionary theory, trying to “nail him” by saying his faith perspective is essential evolutionary. Well, not quite.) I like his approach a lot, actually, and have been pondering it since I started the book. I will offer a few brief criticisms later, but for now, I celebrate and affirm and commend the basic approach, design and advise offered here. He suggests we go through four stages or levels or kinds of spiritual experience. We can pray in each of these by using these key words that illustrate and give voice to our longings and needs at this stage. Here’s the overview. His words in this first part are Here (as in God is here, I am here) Thanks (he explains the often used Hebrew word dayenu) and O, which he links to the word hallelujah. His call to practice jubilation and to stand in awe is just beautiful! In this section the words that are used to facilitate our prayers are Sorry, Help, and Please. The chapters on intercession (“Please”) are wonderfully helpful, reminding us to be “stretcher bearers” bringing others to Jesus like those guys who ripped the roof off to get their friend to Jesus. This is an intense section, and, again, very helpful, I’d think, for both beginners (who may have not realized that there is so much lament in the Bible and that doubt is not to be shunned) and for those of us who know in our gut that this is a good stage, but find it naturally unsettling. Here are the words he uses to help us in this season: When, No, and Why. There are many good books on our struggles with hard times, dry times, the “dark night of the soul” and how to express our questions and anger at God. This is as clear and helpful as any. McLaren draws on his friend Richard Rohr, here, whose Center for Action and Contemplation unites social reformers and contemplatives, helping deepen the tradition represented by voices such as Thomas Merton, Elizabeth O’Connor and Parker Palmer, each who have directly taught on how to be “contemplatives in a world of action” and have advised that social activists not try to challenge the evils of this world without attending to the deepest issues of our own sinful selves. â€¨â€¨This is a huge interest of mine, and I’m afraid I’ve not found my way into God’s grace to adequately transform me here, yet. I mentioned him a few posts ago, but David Naugle’s Eerdman’s release Reordered Love, Reordered Lives is a very helpful and balanced study of how our desires and loves can be formed by the ways of God. Excellent! This is also the theme of the new Rick McKinley book, A Kingdom Called Desire: Confronted by the Love of a Risen King (Zondervan.) I long for a gospel-transformed life, for Christ’s power and imputation of His character to become my own, seen in how life is lived out in daily grind of work and home as well as in the public square. Those of us who speak a lot and work hard to inspire social change simply must be also attentive to our own inner lives lest we foist our own hurts and fears on our public work. Sure, many of us will want to enhance and under-gird Naked Spirituality–making it a bit less naked, I guess— with a more impeccable orthodox theology and robust Cruciform discipleship, standing in the best traditions of “mere Christianity” and creedal truths, lived out together in a community of faith, a real neighborhood church. But this guidebook to simple words for a not so simple spirituality is an incredible gift, a true asset to us, bread for the journey. 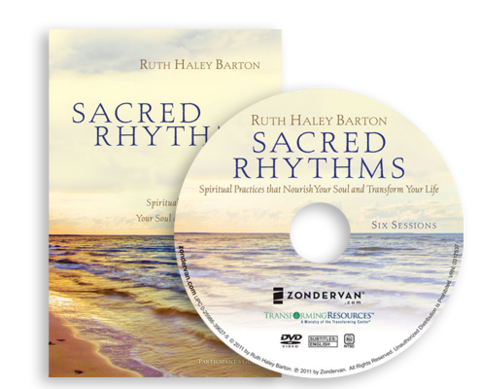 Sacred Rhythms: Spiritual Practices that Nourish Your Soul and Transform Your Life DVD Ruth Haley Barton (Zondervan) $31.99 book and DVD study pack. I’ve often said that Ruth Haley’s books, esp Search for Solitude and Silence and Sacred Rhythms, are amongst my all time favorite books in their huge field of so many great titles. 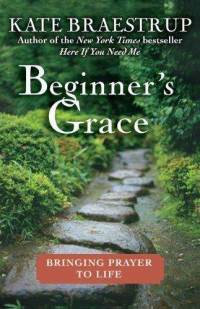 Ruth is a friend, a great speaker, a lively and honest teacher, and one whose journey into contemplative spirituality has deepened and matured and widened over the years. She is a guide I trust, a speaker we enjoy, and an author that we always recommend, any chance we can. Those of you who have meet us where we have sold books at events, conferences, retreats or workshops know this is true. We are fans. At last, the energy, charm, pleasantness and vibrant teaching of Ruth is available on DVD. The books are very good, but seeing her live is a real treat and we simply cannot say enough about this new curriculum. It is based quite obviously on the book by this title, and includes six sessions. The study guide is designed for the DVD and is a wonderful way to experience and incorporate these spiritual teachings into your life. The study book is ideal for anyone to use, but I suppose it is mostly designed for small groups, classes, retreatants, or prayer circles. I love this stuff, and couldn’t be more pleased to recommend a DVD set. It will expand Ruth’s ministry, will invite many into this conversation, and will appeal to those longing to arrange their lives in ways that actually facilitates God’s transforming work. Here are the session titles that are included on the DVD and study. We are confident that this will have a significant impact on those who watch it. Gather some friends together, share it with a Bible study group, watch it with your family. Go it alone if you must, but this is really inspiring, very helpful, and a great, rare resource for exploring how to know God better, allowing the Spirit to shape your lives, all because we create space and time for God to do in us what only God can. Nice! 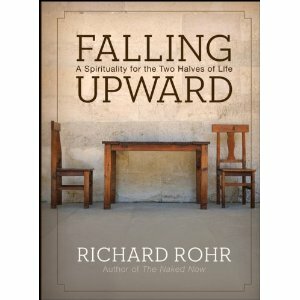 Falling Upward: A Spirituality for the Two Halves of Life Richard Rohr (Jossey Bass) $19.95 Rohr is a Franciscan and we have carried his books for as long as we’ve been in business. He’s written on Scripture study, or contemplative spirituality, or the social witness of the church, several fascinating books on men’s issues, and, recently, the much-loved introduction to contemplative living called Everything Belongs and the popular Naked Now. He’s a mystic with his feet planted on the ground, a very contemporary Catholic who reads in interfaith circles. His footnotes include some psycho-spiritual writers, from Jung to Sam Keen to Ken Wilber. He’s obviously fluent in the medieval mystics (St John of the Cross and the like.) He’s a writer you should know. Here is the interesting thing about Falling Upward. As the title implies, it is about failure, about brokenness, about failing. Yet, for this good Franciscan, suffering is redemptive, being in touch with our sorrows and deepest selves is healing, and, well, helps makes us who we are. That can sound cheesy and like a motivational speaker, or it can, in the right hands, be profoundly liberating. Rohr works with this theme and applies it to aging. The two halves of life are not exactly chronological—the younger years versus the older years—but alludes to the years of messing up and the years of deepening wisdom. Like the Bible, brother R supposes that older folks can be elders. They can become our mentors and guides. There can be rituals and ways of affirming this, even. However, for older folks to be deep and faithful guides, we must all realize the ways to see how our failings can be the foundations of our spiritual lives. Fascinating. ritten as a memoir, reflecting on her remarriage and ongoing ministry among this rough population of forest rangers, cops and first responders. â€¨â€¨Braestup is ordained to this taxing, adventurous and seriously compassionate calling through the Unitarian-Universalists, so her theology is decidedly liberal. She’s a great story-teller–Phyllis Tickle, who raved about it, said it was “frank” which is a sturdy way of saying it. And goodness, what stories she has— Braestrup has been through so much, seen so much, that she has earned the right to be heard. This book was written largely out of her own struggles with prayer, and a fairly regular need to pray with those in very hard places—with parents whose child is lost in the woods, with mourning spouses after a drowning accident, with fellow EMTs or cops when one of their own is fallen in duty. This book will make you cry and a few parts will make you laugh. (Those of us who have been through great trauma will understand the story of Braestrup crying with a young woman whose husband’s body was recovered from a frozen lake, who wanted to touch him one last time, and did so as they unzipped the body bag, only to then laughed through her horrific grief, blurting out that she never really liked that shirt her husband was wearing.) Can tears be prayers? Can laughter? Can one learn to love God even if the words aren’t right? My, my, this is sweet, good stuff. 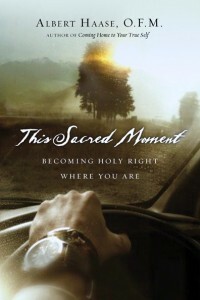 This Sacred Moment: Becoming Holy Right Where You Are Albert Haase (IVP) $15.00 I have been so intrigued that InterVarsity Press, a solid, thoughtful, favorite evangelical publisher has been releasing more books by Catholic writers in the past decade, especially in their spirituality-focused imprint formatio. This is a good thing, of course, and important. I hate to show too many of my fussy evangelical cards (as I did in my admission of having some concerns about McLaren’s theological shifts) but in a way, it is helpful to have books from the Catholic and monastic tradition considered, vetted and published by one of the most reliable and thoughtful evangelical publishers. There is, within Catholic presses, not unlike liberal Protestant houses or fundamentalist and charismatic publishing firms, all manner of weirdness. So helping get some of the very best spiritual formation stuff from Catholic retreat leaders that might be most useful for Protestant readers is quite helpful. So kudos to IVP. And kudos to whoever chose this title as it is delightful, sharp, nicely written, and realistic in our hope to find deeper intimacy with God. Haase is obviously a good guy and a fine writer. “What does it mean to be a holy person,” the back cover asks. The answer might surprise you. Father Haase tells us it is the ordinary stuff of life that is the crucible for increasing holiness. “Any and every situation holds the grace for the transformation called holiness.” He invites us to imitate Christ and empty ourselves for the benefit of others. Besides the shout-out there to the classic Imitation of Christ you may hear shades of another influential classic Abandonment to Divine Providence (also published as Sacrament of the Present Moment.) Yep, this is basic stuff, and yet his guidance–and he offers concrete practices that helps us learn how to wisely discern what God might be calling us to in any given situation–allows us to take commonly accepted faithful ideas and helps us learn to live it. I suppose it is fair to say that Haase writes as a Franciscan (that is, with simplicity and charity) and yet despite the short chapters and practical application stuff, it is significant and profound. The discussion questions are great and could last a year; if you have a trusted spiritual companion, it would be ideal to work on them together.â€¨â€¨Fr. Haase has been a missionary to China, hosts a weekly radio show, and has authored Coming Home to Your True Self and Living the Lord’s Prayer. Very instructive, encouraging, and a real blessing. principles” which are explored in short chapters through-out the book. me. Consequently, every moment is sacred. hindrance to selfless openness to God’s call in this sacred moment. 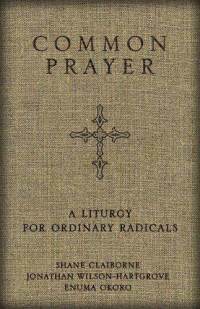 Common Prayer: A Liturgy for Ordinary Radicals Shane Claiborne, Jonathan Wilson Hartgrove, Enuma Okoro (Zondervan) $24.99 I discussed this remarkable resource at great length when it first came out early in Advent of last year, reviewing here it in BookNotes. If you don’t know about it, I hope you click back to our previous review, which explains it all pretty nicely. In the winter months we have come to hear of a number of groups that are using it, and loving it. Now, in Lent, it dawns on me that I should suggest it again, as it is truly a great prayer book, with interesting sidebars, some nice woodcut touches, a ribbon marker and–obviously, most importantly—substantial prayers that are both historic and very contemporary, ancient and a bit future, with cadences of the older prayer books and yet designed, mostly, for folk who aren’t quite use to the rhythms and disciplines of praying out loud from a common prayer book. This is rich and good. It would aid your prayer life these important next days, I’m sure, and would make a very nice, lasting, gift. Well, there they are. Nearer the final leg of our Lenten journey, maybe these would prove helpful along the way. We can send ’em out right away, of course. Hope you appreciate the suggestions and the discounts. It is our joy to offer these diverse kinds of resources. Peace. Byron, our first bonding happened over Brian McLaren. I think it was right after I had finished my favorite book by him, More Ready Than You Realize. I even got to experience a similar email relationship to the one he had with the girl he wrote to through the book. She even came to a commitment to Jesus. Just like the book.